Modern cognitive science is proving that music is a fast-paced game that takes place inside the brain of the listener. This deep, stimulating engagement is the reason why music predates history, science, possibly even language. Adding visual arts to a musical concept offers a unique activity for the music listener, creating an internal dialogue between brain centers that don't always work together. Duke Ellington told about his desires to paint with music. Perhaps the most famous example of "art music" is the classical suite Pictures at an Exhibition, composed by Mussorgsky, orchestrated by Ravel, with paintings and drawings Victor Hartmann. A new work composed by Ted Nash was recently performed by the Jazz at Lincoln Center Orchestra to great modern works of art, entitled Portraits. 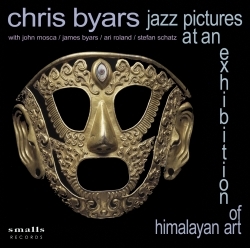 Our recent project, Jazz Pictures at an Exhibition of Himalayan Art, adds an element of the exotic. The art and culture of the Himalayas is emerging from obscurity since the opening of the Rubin Museum of Art in New York City. Using images on loan from this vast collection, we provide an interpretation of the colors, curves, and themes shown in paintings and sculptures that date back 500 years. Our music includes the sounds and concepts of the Asian culture without departing from the jazz idiom; these are truly "Jazz Pictures." In the CD package, we omitted wordy liner notes in favor of an 8" x 14" fold-out poster. CD buyers will see on one side, all the artwork used in the suite, and on the reverse, pictures from a live performance with the artwork photocast behind the band, sometimes on the band. The listener will witness jazz embracing something so culturally different, build a new understanding of Himalayan art and culture through jazz, and enjoy the neural fireworks as they observe, comprehend, and enjoy this groundbreaking collaboration of music and visual art.